Congratulations! 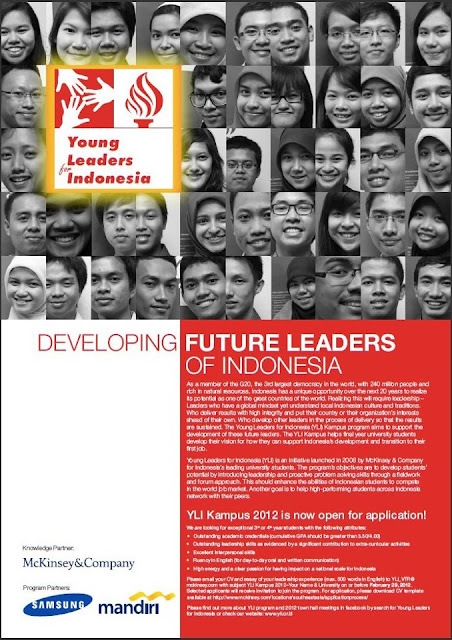 You have been selected as a participant to join Young Leaders for Indonesia Kampus (YLIK) 2012. After carefully reviewing the applications and through a rigorous selection process, the YLI Team is proud to announce The Top 60 Students to join the YLI Kampus program in 2012. And you are one of them! Once again, congratulations on your success! Wooopps! Im dying! Hahaha! Lebay! Well guys, here is the news! 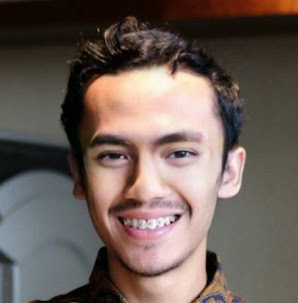 I was named as one from 60 Young Leaders for Indonesia 2012 by McKinsey and Company which is a well-known global management consulting firm, the trusted advisor to the world's leading businesses, governments, and institutions. The Young Leaders for Indonesia (YLI) itself was officially launched in 2008 by McKinsey and Company for 60 Indonesia’s top university students. As its title, this program aims to support the development of the next Indonesia's future leaders. Thousand students have applied for this program and I am so grateful for being part of 60 selected students. People, I am so thrilled to have been selected in one of the most renowned and prestigious leadership program in this country. I know some of the alumni of this program, and for your information: they are indeed inspiring people. Like in my previous note note, I am really looking forward to meeting those outstanding students from all across Indonesia. Meet and greet with high-spirited Indonesian young leaders. My intention writing this post is not to show you how great I am (Oh, come on! There are so many other smarter and more outstanding people than me, aren't there?) I just hope that after you read this simple post, you will be inspired and start thinking that : "Hey, they can do that! Me too. I can do the same thing, too! Or probably more!" High energy and a clear passion for having impact on a national scale for Indonesia.